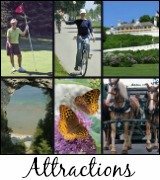 On Mackinac Island Is Pure Michigan! 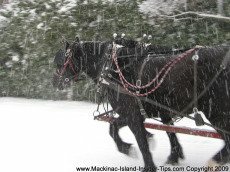 Northern Michigan snowmobiling on Mackinac Island is exhilarating and a fun get-away vacation. 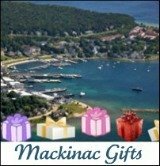 If you are ready for a new winter experience head up to Northern Michigan for a fun day or an overnight stay on Mackinac Island. 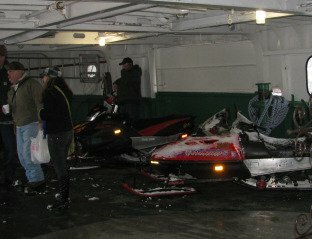 Part of the fun is loading your snowmobile and other winter sports equipment (snow shoes or cross country skiis are ideal) on board the ferry that leaves from Arnold’s St. Ignace dock. 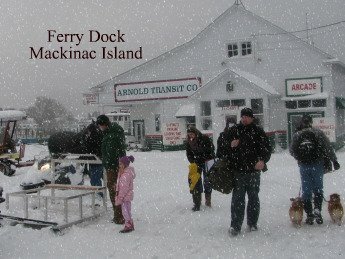 Be sure to arrive early for departures in the winter months are limited going to and coming back from Mackinac Island. 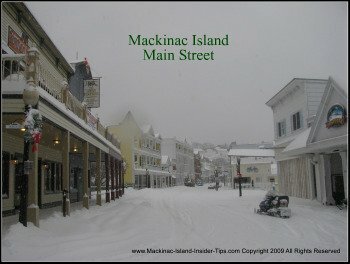 When the Straits of Mackinac become frozen the ferry service actually closes down. Then it’s only the marked trail on the frozen ice that allows you or anyone to get to the island by snowmobile. 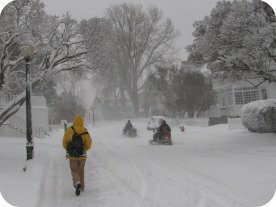 Basically, you are heading to a deserted winter wonderland island when you choose to do some Northern Michigan snowmobiling on Mackinac Island since there are only about 520 hardy year-round residents living there from late October to April. Unload your gear when you reach the Island’s ferry dock and your Northern Michigan snowmobile adventure begins! Please note that snowmobiles on the Island during the winter months are an important and necessary means of transportation for the community. For even though tourists are gone for the season the Island still adheres to the no motorized vehicles allowed on the Island. 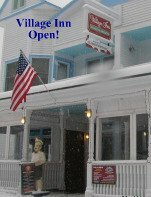 The Mustang Lounge is a great place to begin your Northern Michigan snowmobile adventure. You can find out where to go and where you are not allowed to drive your snowmobiles. And, it's definitely a hot spot to end the day with a cold brew! 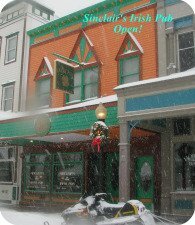 The other fun place is Sinclair's Irish Pub...who knows there might be some singing of ol' Irish ballads in the background or you can begin one! Great drink, great food and great atmosphere to end your fantastic Northern Michigan snowmobiling day! There’s always good times and good food at The Village Inn. It’s a bit more quiet but sometimes that’s what you need after a cold day on the trails. It’s right next to the Pontiac Lodge which is the perfect place to stay for the night. 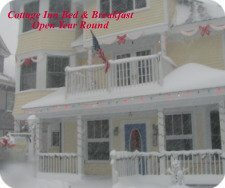 The Cottage Inn of Mackinac is open for Northern Michigan snowmobiling enthusiasts click here to see rates. 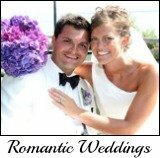 The winter rates are great, so, make a reservation at the quaint and lovely Cottage Inn for a romantic stay after your day on the trails…whether they are snowmobile trails, cross country trails or snow shoes trails. 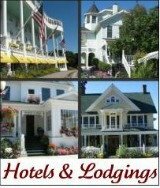 You both will appreciate the warmth and care this Inn provides all year round! 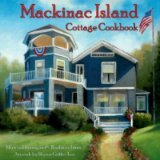 When departing the Island and looking back at the shuttered homes far up on the Bluff you will always remember the time you were high on a hill looking across the cold Straits of Mackinac thinking with deep appreciation of strong men and women of this great land of Northern Michigan who were there long before you…and without the luxury of a snowmobile! 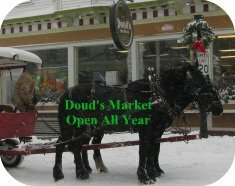 Another Fun Event is UP Pond Hockey in St. Ignace each year! Insider Tip: Christmas and New Year’s are special times on the Island. You and your family can have a peaceful, fun and an adventuresome holiday. 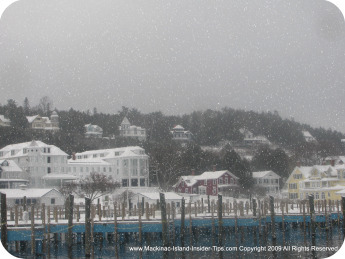 Return to Mackinac Island Insider Tips"